You know how wonderful that perfect little black dress makes you feel. Suddenly you're taller, your waist is smaller, and your skin is the perfect alabaster. And you can't wait for the world to see how perfect your look? 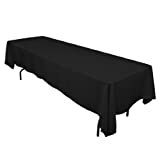 Well that perfect little black tablecloth can do the same thing for your dining room. 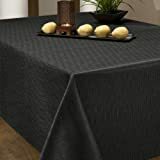 Yes, you read this right - a black tablecloth will bring your china and silver to life in ways you never thought possible. And no, you don't have to love Gothic decor and and skulls and coffins to make this work. Don't worry your house won't look like an Addams Family rerun. Even some brides are considering black for themselves or their bridesmaids. 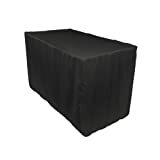 So it's time for us all to liberate the way we use black in our home decor and appreciate a black tablecloth as much as we love our little black dress. Okay back to that little black dress and why you love it so much. Yes it's more than we all think that black makes us look skinny. When you want to show off your diamonds, pearls, gold and sterling silver, what color do you turn to? Yes, that's the spirit - black. 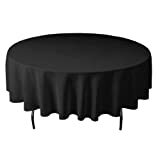 Well what a black dress does for your jewelry a black tablecloth will do for your fine crystal, china and sterling silver. 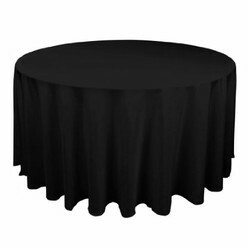 You'll find square, round, and rectangular black tablecloths. Some of the more popular sizes on Amazon include 60 inches x 126 inches, 60 inches x 102, 60 inches x 84 inches or 90 inches x 132 inches. But you'll find so many more dimensions in square and round as well. Now for the table accessories, because that is what black is all about. You've got to bathe black in light and oh what fun that is. This is when you'll pull out your Waterford Crystal candlesticks, your sterling silver candle holder. If you've got an 8-arm crystal chandelier in you're dining room already, well you've got a room made for a black tablecloth. This is the time to love pure white china. Nothing is more classic than black and white with crystal accessories. If you love Zen decor then by all means add some greys and moss green table accents and linens. For a walk on the wild side don't for some animal print accessories. Depending upon your dining room chair stye, you could even add some animal print pillows. Yes of course if it's Halloween then get out the skull candles, witch centerpiece and mini jack-o-lanterns and have a ball. But please remember that there is an elegant side to black home decor.